Aim is joining forces with partners across the state in support of additional funding to combat drug addiction and a variety of health-related issues facing Hoosiers. 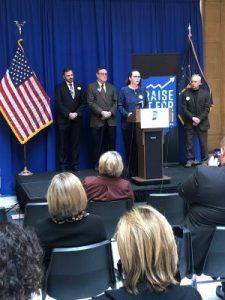 The Raise it for Health Campaign officially kicked off in November with the goal of increasing the state’s cigarette tax by $2 per pack during the upcoming General Assembly session. The campaign wants all new revenue – anticipated at $360 million during the first year of the proposed increase – to go toward health causes, such as drug addiction, tobacco use and infant mortality. The push for the cigarette tax increase comes as lawmakers return to the Statehouse in January for the 2019 legislative session where they’ll write a new, two-year state spending plan. Any debate on the issue is expected to be defined by the state’s dire public health statistics. Indiana currently ranks 49th in per-capita public health spending and has the 9th highest smoking rate in the nation. Ahead of the campaign’s launch, several Indiana mayors issued proclamations to raise awareness of how health-related issues affect the quality of life of their residents. Many of the proclamations noted the high rate of adult smoking in Indiana and the need to bring private and public stakeholders together to address tobacco use, obesity and the opioid epidemic, among other health issues.